This collection combines the foundational works of Hodge and the next generation's Berkhof. Included are their Systematic Theologies, Commentaries (Hodge) and Introduction to the New Testament and Summary of Christian Doctrine (Berkhof). Eight volumes of the foundational works including both author's systematic theologies, introductions and the four-volume Hodge Pauline Commentaries. 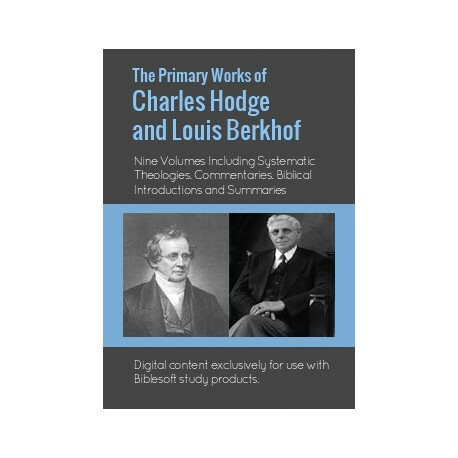 Many online forums profile, compare and contrast the writings of Berkhof and Hodge, and in particular their monumental works of systematic theology. 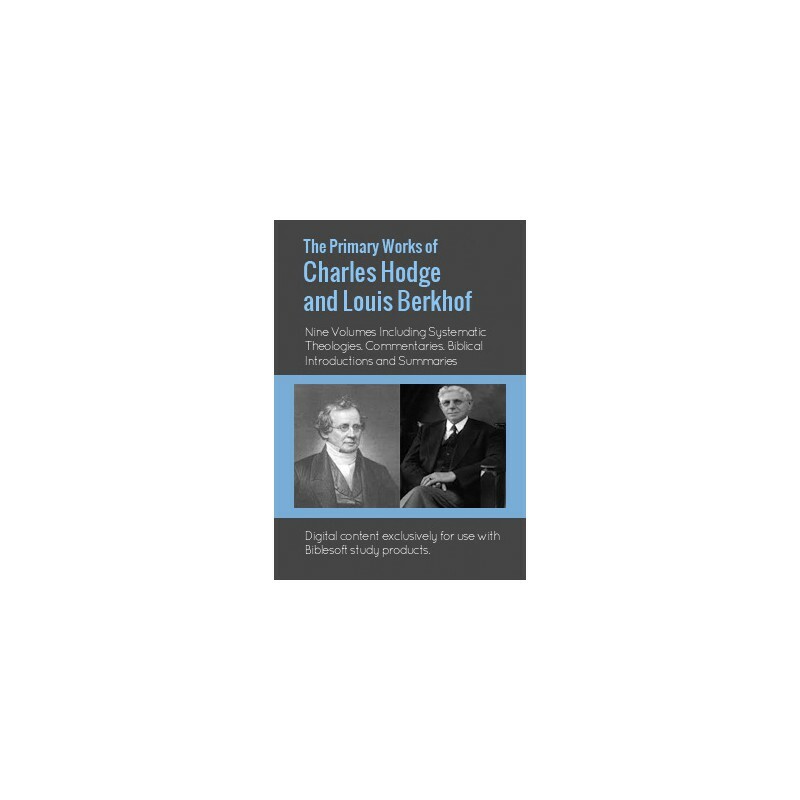 Inevitably an 'either-or' decision is becomes necessary between the comprehensive yet concise Berkhof and the more historically-rich Hodge. Of course there are major differences between the times they lived, their millennial views, and investigative, literary approaches, however their works are recognized as significantly advancing the understanding and application of Reformed Theology. Now you no longer need to choose. Right now save over 60% on the complete systematic theologies of Berkhof and Hodge, plus receive their most important supporting works, such as Berkhof's Summary of Christian Doctrine and Hodge's Commentaries on the Pauline Epistles. Click to take a closer look, and download and start enjoying the reformed insight these works will bring to your study experience. Louis Berkhof Louis Berkhof (1873 - 1957) was a Reformed theologian best known for his Systematic Theology (1932). He taught for almost four decades at Calvin Theological Seminary and served as its president from 1931-1944. In his work on systematic theology Berkhof followed in the line of John Calvin and embraced the development of Reformed theology by the Dutch theologians Abraham Kuyper and Herman Bavinck. Written in a concise and compact style and organized in a manner ideal for detailed study, Systematic Theologycovers the full range of theology in traditional systematic fashion - examining, in order, the doctrines of God, anthropology, Christology, soteriology, ecclesiology, and eschatology. The work also includes an extensive bibliography and full indexes to the authors, subjects, and Scriptures referenced in the text. Revised and enlarged throughout his lifetime until it reached its present final form, Systematic Theology not only stands as Berkhof's magnum opus but also is widely considered to be the most important twentieth-century compendium of Reformed theology. In Introduction to the New Testament, Louis Berkhof investigates the history and purpose of the Gospels and Epistles in the New Testament. Sections begin with a brief outline followed by a comprehensive look at the characteristics, authorship, composition, and canonical significance of each book. Distinctive content includes the nature and inspiration of the gospels in general, and the Johannine problem, in which the first three Synoptic Gospels are set apart from John. Berkhof's Introduction relies on the findings of a wide range of New Testament scholars including the Early Church Fathers. Berkhof's references are very easy to navigate which makes Introduction to the New Testament a prime text for student study. In fact, Berkhof intended this work to be utilized in the classroom at Calvin Theological Seminary where he taught for nearly 30 years. Of course all verse and topical references are tagged for more in-depth study.